Photo © Sikorsky. Click on thumbnail to view high resolution image. BALTIMORE, Maryland - Two MH-60S Seahawk helicopters flew into the Port of Baltimore headed to the Royal Thai Navy, marking the first delivery of the MH-60 to an international customer. The U.S. Navy flew the aircraft from Owego, N.Y., to the Port of Baltimore, Md., ahead of their ocean voyage to Thailand. The aircraft were acquired via the U.S. Government’s Foreign Military Sales program. 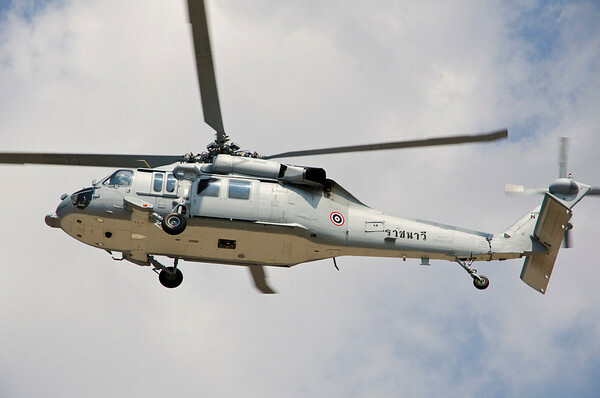 The new Sierra aircraft are an integral part of the Royal Thai Navy’s fleet modernization program to augment the capabilities of six Sikorsky S-70B SEAHAWK and six marinized S-76B helicopters acquired through U.S. Foreign Military Sales in the late 1990s. The Navy has expressed interest in additional MH-60S purchases. The MH-60S helicopters acquired by the Royal Thai Navy are designed for utility missions, such as logistics and troop transport. In addition, the standard searchlight and rescue hoist will enable aircrew to perform search and rescue missions.